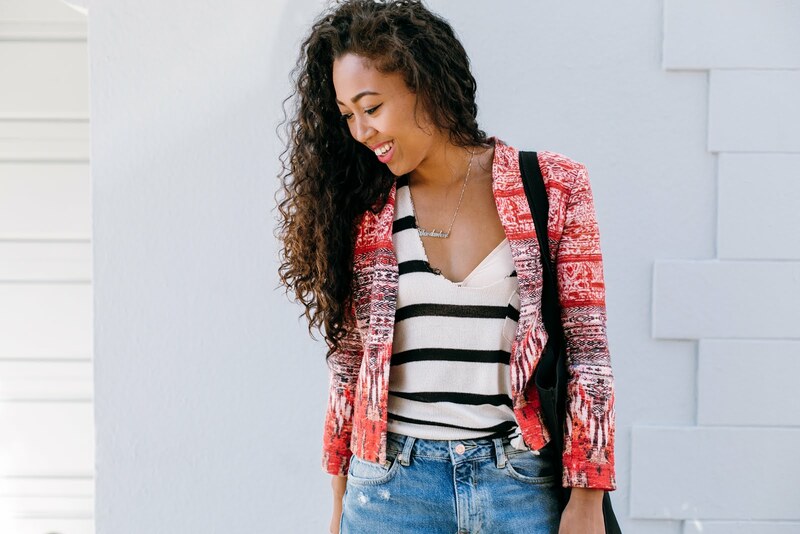 99% of the time, you can find be in casual, easy breezy outfits, like this one. I'm a big proponent of sneakers and wedges, and basically anything else that's easy to walk in. 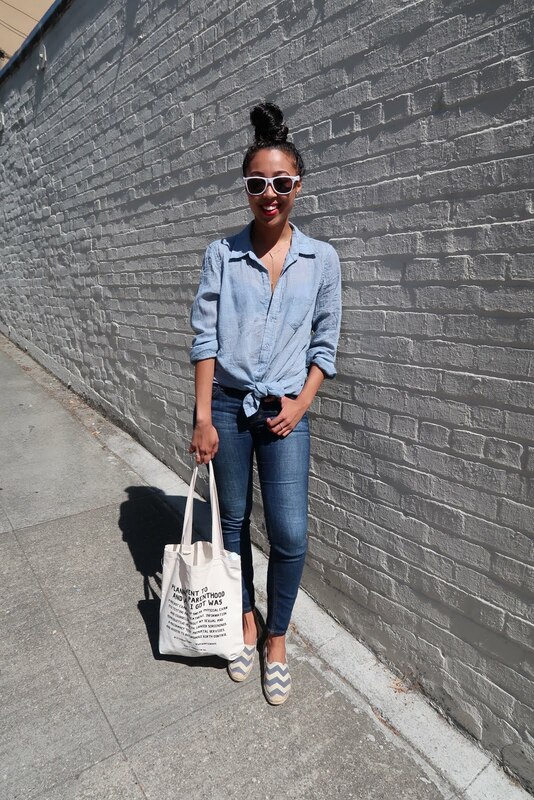 Included in my repertoire of casual-wear are cheeky tote bags, loose tanks and baggy, distressed denim. (Basically, everything you see in this post is what I regularly wear on the weekends.) This particular tote is one that I picked up from a shop in New Orleans. Again, ha, the shop is located next to the Ace we were staying at. It was less than $20 and it spoke to me, so I had to add it to my collection. Every time I wear it, I'm reminded of the mantra plastered on it, "Slow Down, Loosen Up." I'm constantly moving, thinking and doing - sometimes it's nice to be reminded to slow down and to go with the flow. I'm trying to embrace more of that breezy feel so often found in my outfits with friendly reminders (hence, tote bag) and personal mindfulness. The gym, slow weekends and "me" time all help, too. Got some tips for slowing down? Share 'em with me, below! While I was in LA, I stayed downtown at the Ace, which happens to be down the street from BNKR. I couldn't resist hopping in and trying in a few goodies, including this dress! Well, not this exact one because the one I tried on was just a tad too big. I left empty-handed and proceeded to scour the web to find it. After a few searches I found it and now you're looking at the proud owner of the most versatile green dress ever. Seriously. It's the perfect day-to-night frock. Easy to dress up, and even easier to dress down. I styled it with my favorite leather jacket (which is starting to stretch because I wear it to death!) and a pair of leopard sling backs (which actually happen to be a half size too small for me, but I can't bring myself to get rid of them because I love leopard print..). Finished off the look with my new lippie (into the orange pout, you guys?) and a classic pair of sunnies. These days, I'm all about the double-duty pieces. After getting rid of half my closet, I'm only added pieces that can be worn well (and to death!). Ever since I cleared out my closet, I've been finding many oldies, but goodies, like this chambray shirt and matching stripe chevron stripe Soludos. I've been putting so many of my "new" clothes into rotation, that I'm getting lots of questions about my outfits. Sadly, most items are no longer available (these are like years old, guys, ha), but I'm doing my best to share similar items in the widgets at the end of my posts. I actually wore this frock right before the Fourth, to get into the festive spirit. Ironic to wear a Canadian tuxedo in preparation to celebration the US's independence, but it is what it is, ha. But, because the Fourth is long gone, I decided to do a post on combating the much-hated Monday blues. Scroll below for some fun tips and treats! I love a good jumpsuit, but the truth is I only own one...and you're looking at it. Don't get me wrong - I have a ton of rompers, but sometimes I feel like jumpsuits are hit or miss. I decided that I'd rather try and return, than not try at all, because landing on the right one is such a score! I grabbed this stunner from Zara. Unfortunately, like with most Zara pieces, this one is all sold out, but I've shared a couple of my favorite black and white options (as well as other similar items to this outfit) in the widget at the end of this post! 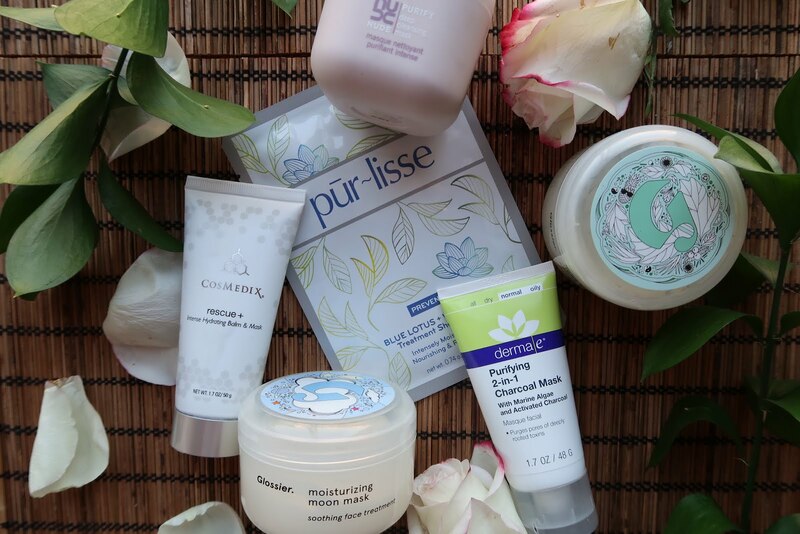 If there's one thing you must know about me it's that I'm a skincare junkie. I turn 30 next year, but I'm trying to keep my skin age 18. Luckily for me, most people still think I'm in my early 20s (which used to bother me), but now I don't mind at all. One secret? Masks. I love a good mask. My ideal Sunday evening is spent in a good mask (or two! ), with candles or sage burning, and Friends playing in the background. So, as someone with a bit of an obsession with masks, I decided to do a round-up of my current faves and must haves. You may have noticed on the gram that I've been hit by the travel bug again. I've been taking my weekend escapes seriously and jetting off just about every chance I've been able to. So far this year, we've been to Palm Springs, New Orleans, LA, and of course, wine country. Not so bad for the first half the year, if I do say so myself. Now that summer is in full swing, I've got longer itineraries on my mind. Although nothing is booked yet, I'm thinking I may pull the trigger with all of these international deals. But where to? Well, for starters, the pound is at a 31-year low. Yes, 31-year low. Can you imagine how much you can save on travel to London right now? (If not, refer to this handy Brexit Calculator that Virgin put together to help you calculate your savings!) If you're itching to head across the pond, then I've got the perfect post for you. I've partnered with Virgin Atlantic to put together a handy guide for all the things to see, do and eat in London in 48 hours. Of course, if you're heading all the way over, may as well stay longer.. but just in case, here's all the musts.